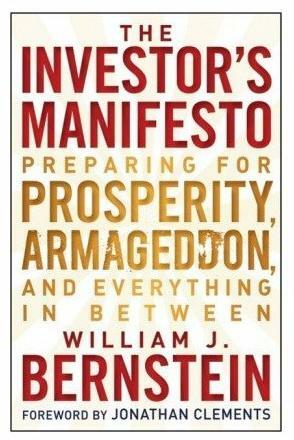 Comments: William Bernstein deals with the very basics of investing and dispels some commonly held myths. An excellent book. May not interest everyone but if you are interested in understanding personal finance and investing, it’s a great book. 1. You don’t invest to get rich, you invest so as to not die poor. Great investments are not risky investments that produce prolific returns. They produce steady returns and avoid worst case scenarios. Of course, you cannot get great returns without great risk. 2. Understanding financial history is critical for a good investor. Long term capital management’s famous failure was because their equation did not take financial history into account. 3. You are your worst enemy. You cannot time the market. Don’t try. And don’t look for patterns in the financial markets. There are none. – primary decision as investor is overall mix of stocks and bonds. Diversify diversify. – focus on the portfolio. Do not pay too much attention to best/worst. They change. – You are your worst enemy. You cannot time the market. Don’t try. – Don’t look for patterns in the financial markets. There are none. – index fund – consistent 8/10. It will never hit 10/10 but it won’t be a 1/10 either. Returns are proportional to risk…..
– Pro Tip – House: Whenever you go to a realtor, find out what the house rents at and multiply by 150. If you are charged above that, you are paying too much.